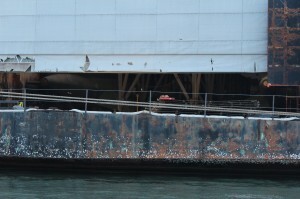 Remember the huge gray mystery barge on Pier1 East of TISC? It housed a once-secret Navy “stealth” research vessel. 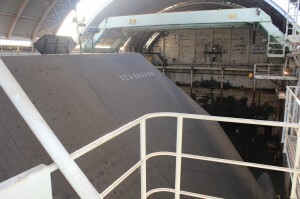 “Sea Shadow” is now gone. 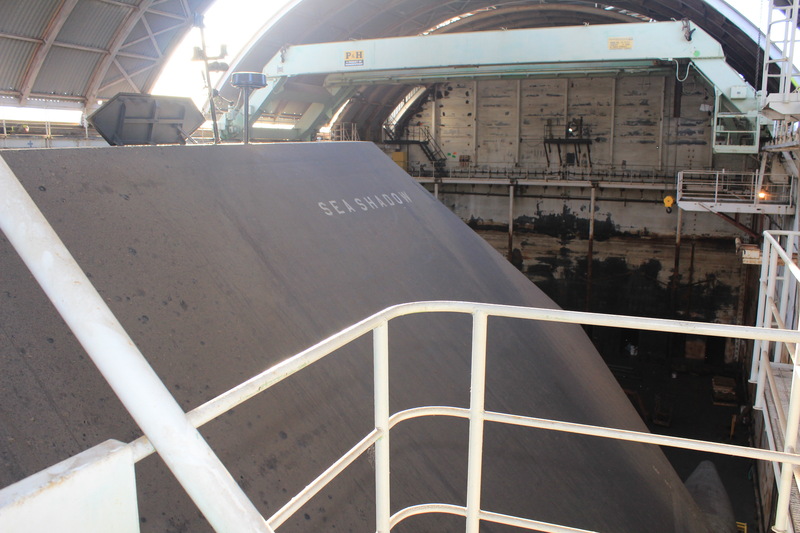 In its place: Bay Ship &Yacht employees working efficiently to recondition massive sea barges and Super Yachts. 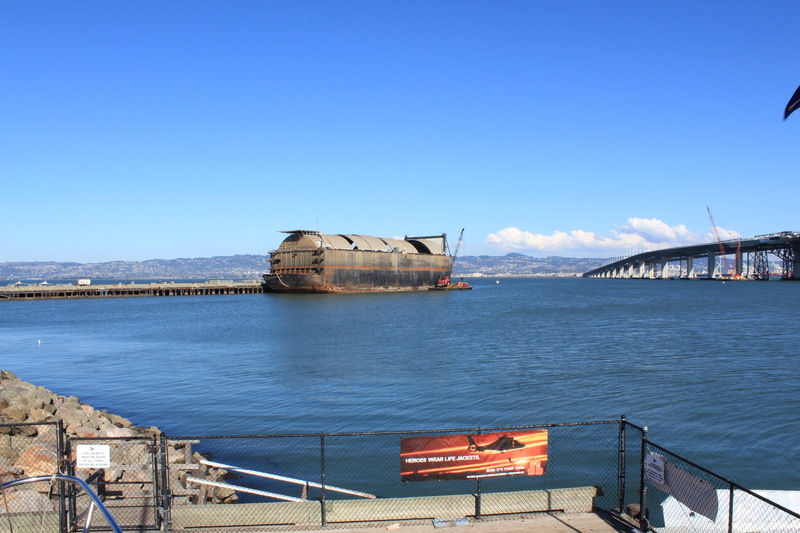 We first noticed HMB-1’s arrival at Pier 1 on a sail to Angel Island a year ago last August. 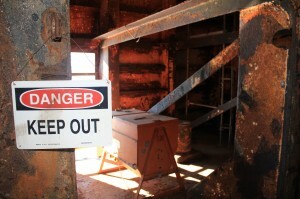 It was large and appeared shrouded in secrecy. 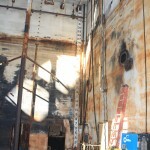 Peering under the nearly-closed seven-story tall door, we saw suspicious looking “torpedoes” inside. 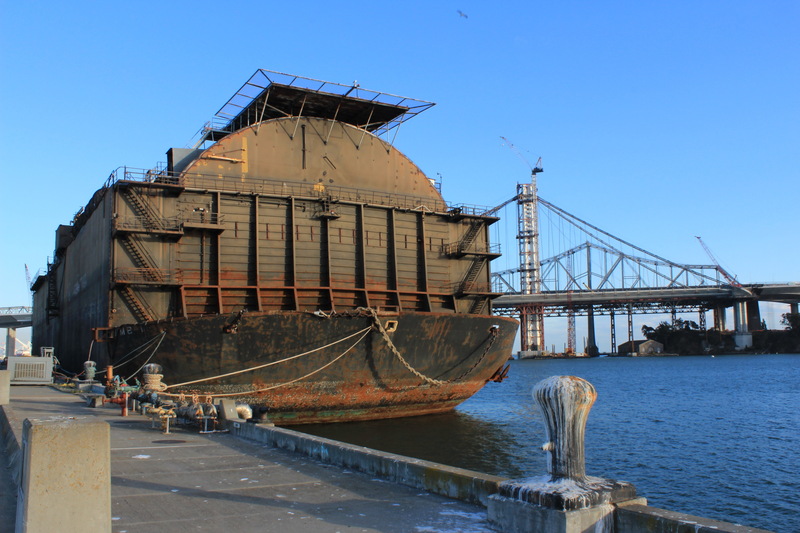 With help from Google (the search engine, not the “new” secret barge at Pier 1) the story became clear: Bay Ship & Yacht had purchased the Hughes Mining Barge-1 with Sea Shadow inside. 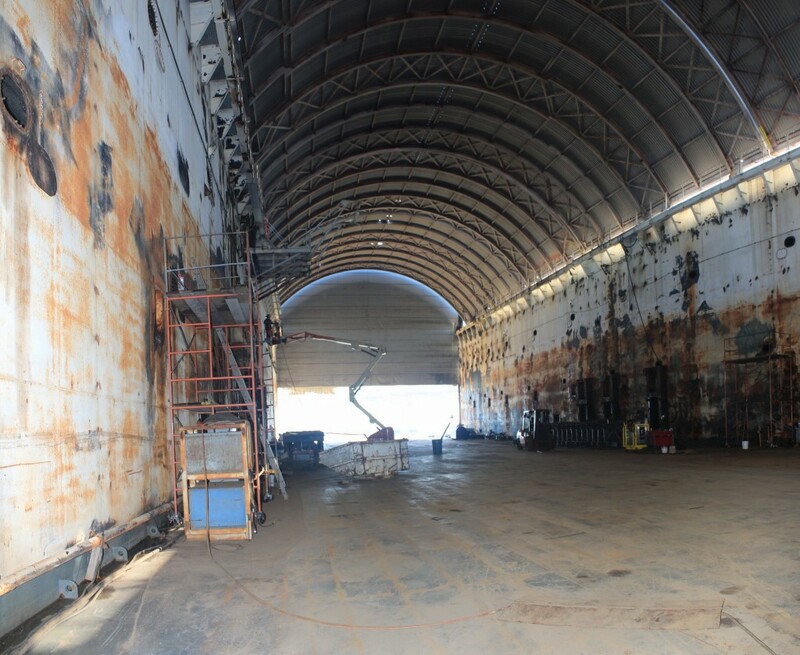 The former was first constructed to support a secret CIA mission to recover a sunken soviet submarine; the latter was built by Lockheed in Redwood City to develop stealth technologies for navy ships. 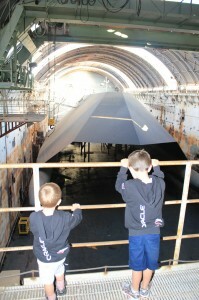 We were fortunate to tour the still-in-tact Sea Shadow. 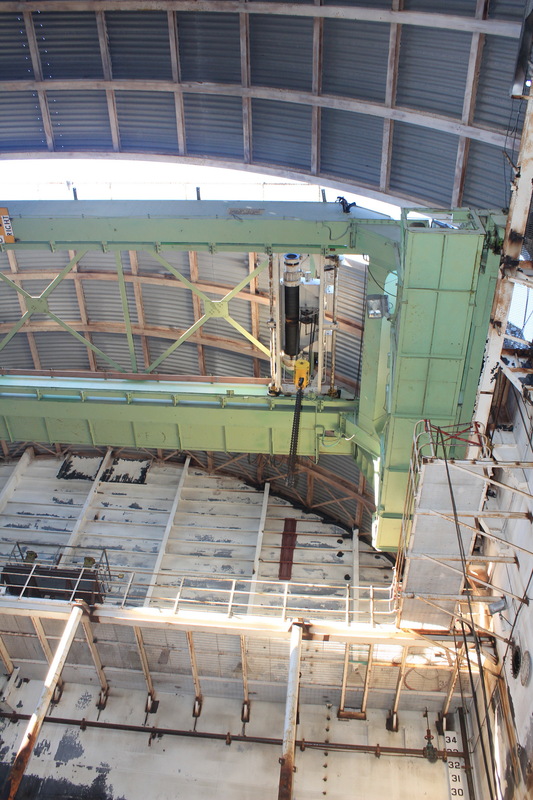 We then watched HMB-1‘s progress over the last year from our vantage point on Clipper Cove as Bay Ship fulfilled the terms of their agreement with the Navy which called for them to dismantle Sea Shadow as they repurposed HMB-1. 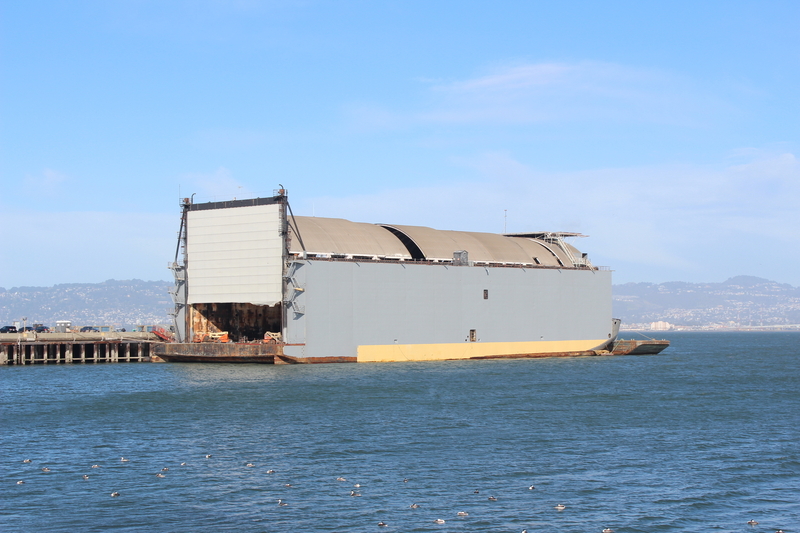 Last Friday we visited Bay Ship to observe HMB-1’s new role as an efficient, high-tech dry dock for ocean-going barges and super-yachts. 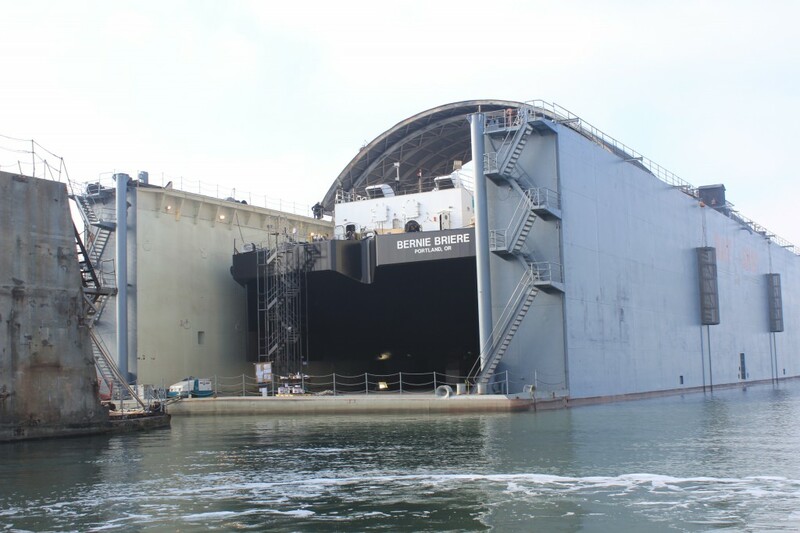 The pictures below were taken at various stages of HMB-1’s journey from Sea Shadow tender to Bay Ships state-of-the-art dry dock, the only enclosed facility of its kind on the West Coast. Our visit inside Sea Shadow was in October, ’12. 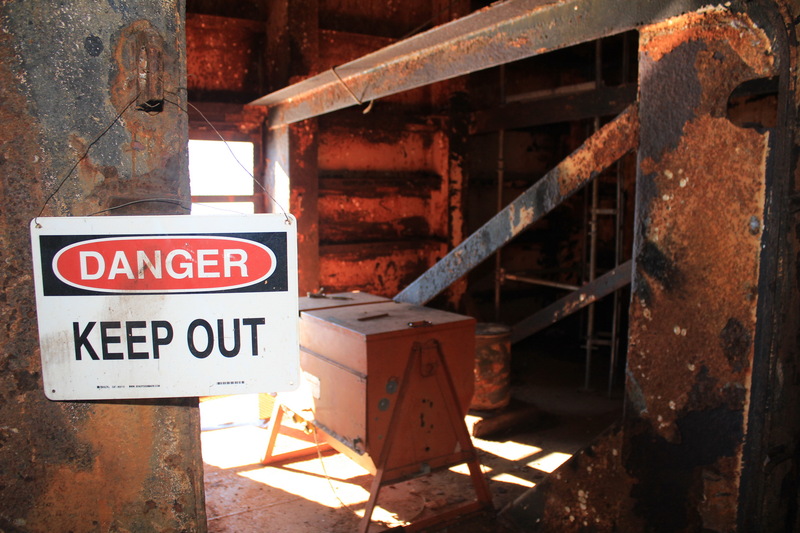 It was a long climb up steep rusty stairs and ladders to get topside on HMB-1. 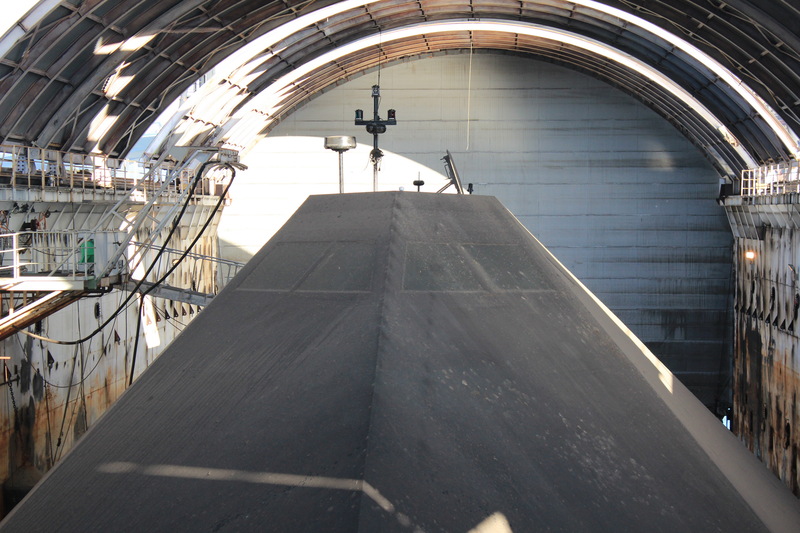 Then another traverse across two 40’ high catwalks around a corner to the gangway leading inside Sea Shadow. 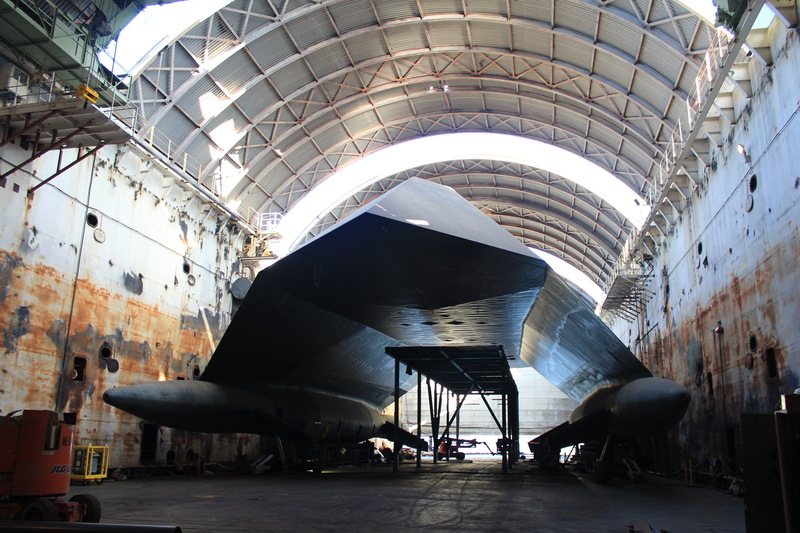 No matter which vantage point we selected, Sea Shadow appeared larger than life. 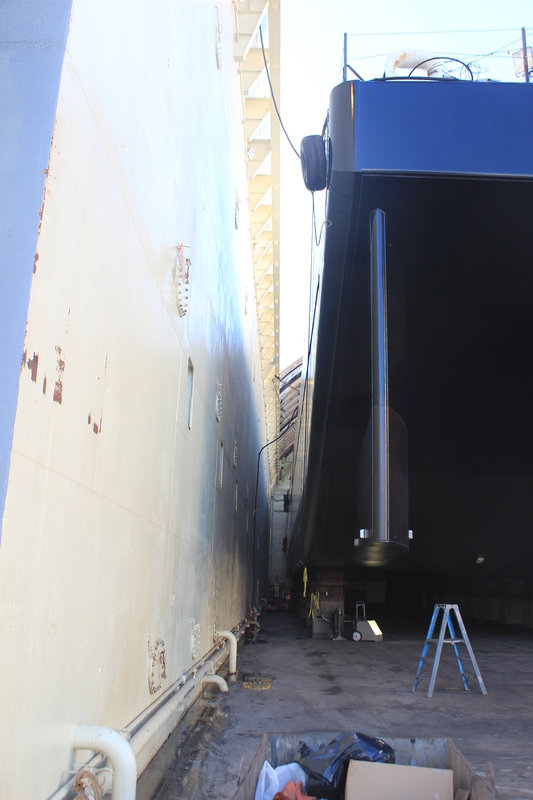 She was 68′ wide below the water, resulting in a slim 4′ margin on each side when entering/exiting HMB-1. 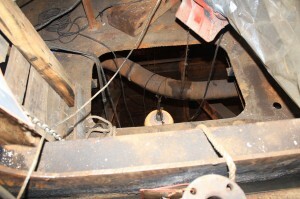 These pictures were taken from the upper level in HMB-1. The interior spaces were compact but not crowded. Sea Shadow was designed as a test-bed. 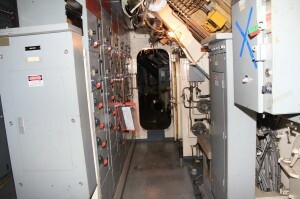 There were bunks for 12; however she was generally “at sea” for hours not days. The twin pontoons were 15′ under the water, and she was about half a football field in length. When viewed from below she looked massive. 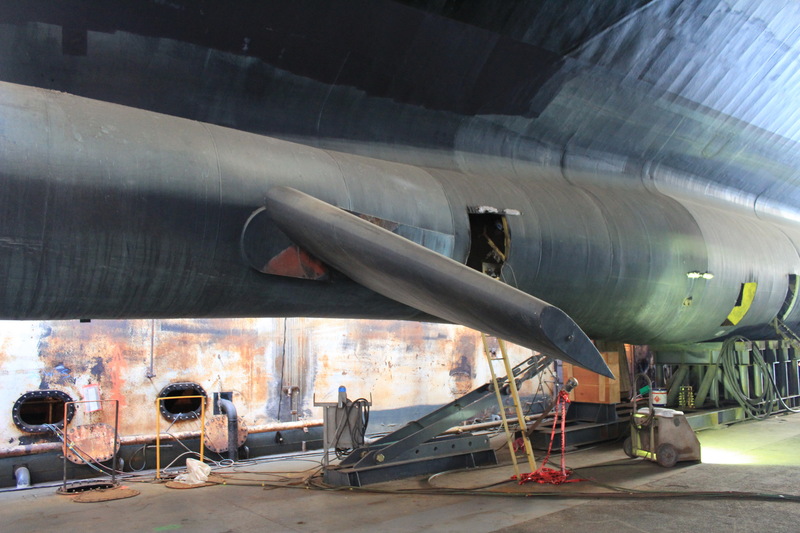 I won’t be posting the pictures from my visit on November 19th because watching the dismantling operation of a historic sleek craft like Sea Shadow was difficult and distressing. Not pictures for publication. 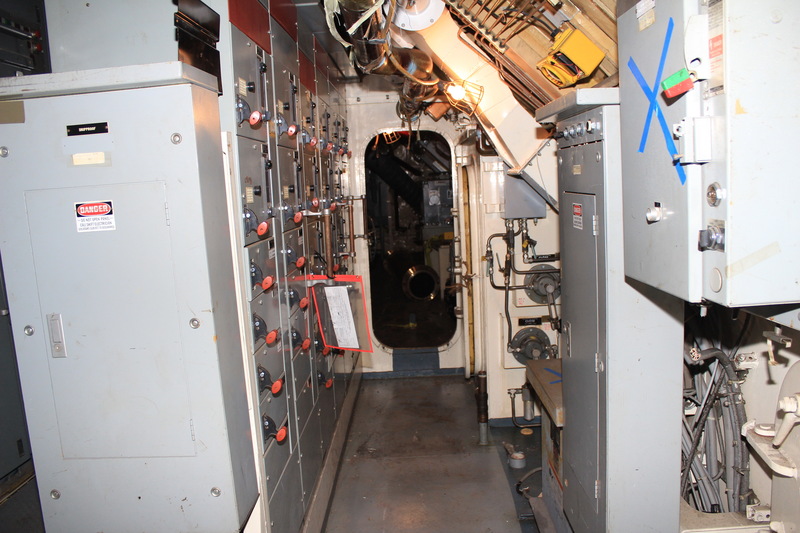 Three weeks later Sea Shadow was gone and HMB-1 looked cavernous. 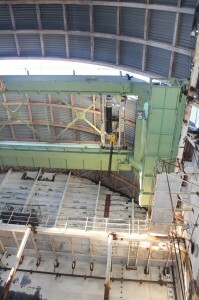 Catwalks were being revamped and crane work was underway. 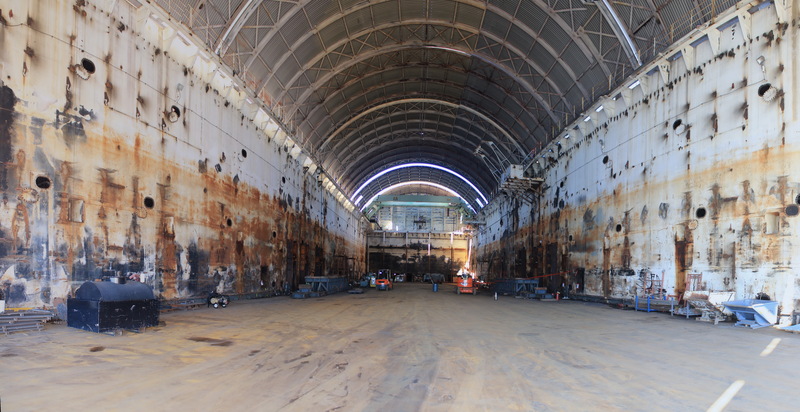 Mostly out-of-sight in the spaces between the double hull, HMB-1 was being converted from a submarine to a dry dock. 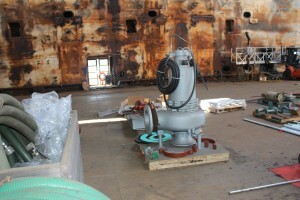 In a submarine water gets displaced by compresssed air to surface; in a dry dock water is pumped in and out. 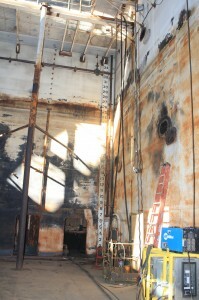 By March, 2013 the internal outfitting was well underway and the outside painting was nearly complete. 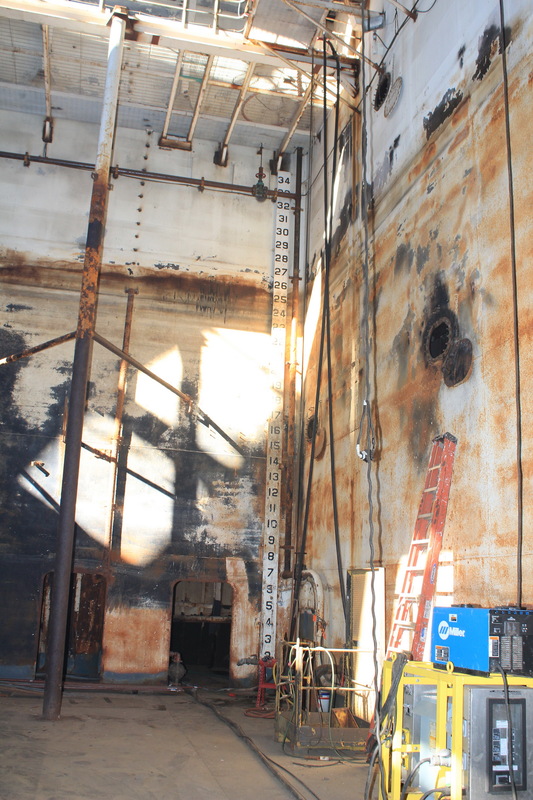 The Bernie Briere is currently undergoing refitting and refurbishing in HMB-1 which was officially announced by Bay Ship & Yacht in August. 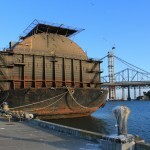 You get a sense of the size of these ocean-going barges when out of the water. 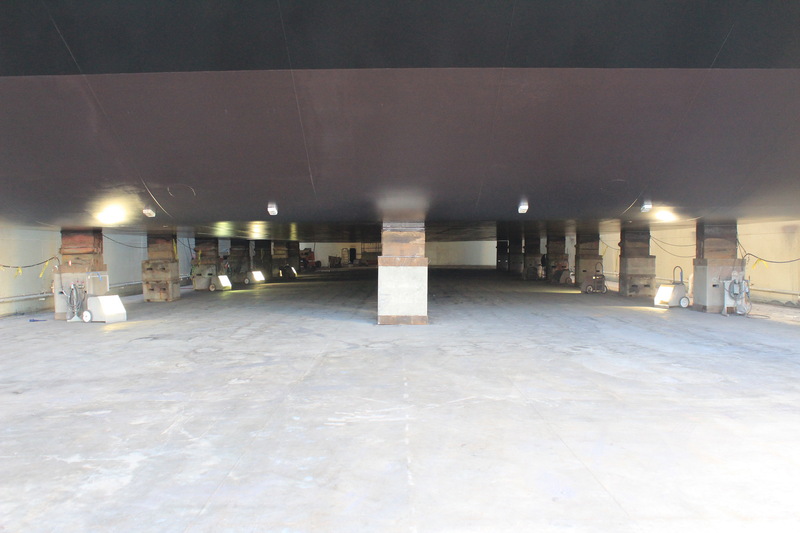 They are approximately 240′ long, 64′ wide and 24′ deep! It was sad watching Sea Shadow’s passing. Her history has been well documented, however, and Bay Ship has used HMB-1’s repurposed interior space to create jobs and increase the efficiency of large vessel maintenance just across the Bay from Clipper Cove. This entry was posted in Uncategorized and tagged Bay Ship and Yacht, Clipper Cove, HMB-1, Hughes Mining Barge-1, Project Azorian, Sea Shadow, Treasure Island Pier 1, Treasure Island Sailing Center by skippersgift. Bookmark the permalink.